Alex and Brett began a blog in August 2005 as “a teenage rebellion against low expectations.” By the following year it had expanded to become a website, TheRebelution.com. Since then, their site has received over 32 million hits, making the Harris twins among the most widely read teen writers on the internet. 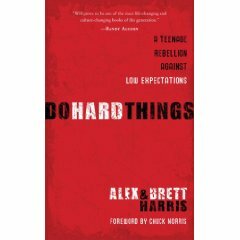 Their first book, Do Hard Things , was released on April 15, 2008, by Multnomah Books. In June 2007, Alex and Brett went on their first nationwide Rebelution Tour, hosting a series of one-day conferences for teens, young adults, and parents. Alex and Brett are currently sophomores at Patrick Henry College in Purcellville, Virginia. When they’re not at school or on tour they live with their parents and three younger siblings in Gresham, Oregon (near Portland), where they attend Household of Faith Community Church. Their older brother, Joshua, bestselling author of I Kissed Dating Goodbye and Boy Meets Girl , now serves as Senior Pastor of Covenant Life Church in Gaithersburg, Maryland. 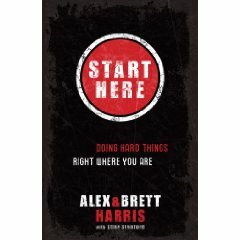 Alex and Brett’s newest book, Start Here: Doing Hard Things Right Where You Are , will be released on March 16, 2010.